Japan tops the latest list of the world's supercomputers by nearly tripling the processor capacity of the previous computer king. As a country, Japan is known primarily for three things: animated characters with eyes that would make a baby deer jealous, inventive culinary applications for raw fish, and an overriding obsession with the latest and greatest technology. It should come as little surprise then, that the Land of the Rising Sun has nabbed the top spot on the most recent list of the world's top 500 supercomputers. 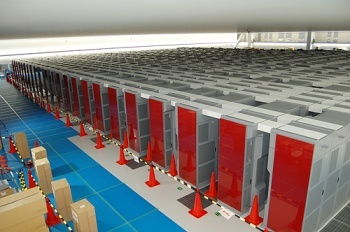 Created as a joint project by researchers working for Fujitsu and the RIKEN Advanced Institute for Computational Science, the modestly-named "K computer" is capable of "8.162 petaflops." In layman's terms, that would be 8.162 quadrillion floating point operations per second. By contrast, the previous world's fastest supercomputer, China's "Tianhe-1A," clocks a paltry 2.6 petaflops. The United States managed to snag the third place spot thanks to the Department of Energy's "Jaguar" supercomputer. It only manages 1.75 petaflops, but easily wins the award for "supercomputer with most wicked rad name." So how do you build an 8-plus petaflop monster like the K? First, you need 68,544 CPUs, and custom built interlinking software that allows the machine to achieve an "extraordinarily high computing efficiency ratio of 93." Assuming you can manage that, the millions of dollars in cooling equipment and storage space necessary to house the massive machine should be pretty easy to acquire. The really impressive bit is that the K is not yet complete, at least according to the official press release from RIKEN. "When configuration of the K computer is complete in 2012, it is designed to achieve LINPACK performance of 10 petaflops. It will be widely used in a variety of computational science fields where it is expected to contribute to the generation of world-class research results," it claims. That's very diplomatic, but I think we can all see where Japan is going with this whole "K computer" project. I mean, who did you expect would pilot that life-sized Gundam they built? Whiny teenagers?